Recently I have been seeing a lot of Indian/Indianized recipes in the Western cookbooks. The Curried Pasta and Vegetables is one such recipe from the book “1001 Low-Fat Vegetarian Recipes”. As the name suggests the book has 1001 low-fat vegetarian recipes; from appetizers to desserts the recipes are classified under 17 categories. I think I have to keep renewing this book in the library at least for 2-3 months. Coming to this recipe, I adapted it from one of the recipes in the book. This is also a vegan pasta dish, without any cheese. Since the pasta gets it’s flavor from the curry sauce, the taste gets even better the next day. So you can prepare this on Sunday evening and have it for Monday’s dinner. The curry sauce can also be prepared ahead and it’s also versatile. Just throw in the vegetables you have at hand, the curry sauce and the pasta, you have a wholesome and nutritious meal ready in no time. 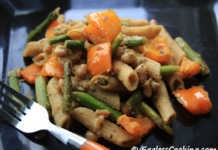 A very simple recipe to prepare a satisfying vegan pasta dish using whole wheat pasta, mixed vegetables and curry sauce. The beauty of this recipe is its simplicity which doesn’t call for any special vegan ingredients, although adding some nutritional yeast would elevate the taste and flavor. Add 2 teaspoons olive oil to a medium saucepan; saute onion and garlic for 2 to 3 minutes. Stir in flour, curry powder and chilli powder. Cook 1 minute, stirring. Add broth and heat to boiling. Steam the vegetables for 8-10 minutes if using frozen vegetables. If using fresh ones 6-8 minutes should be fine. Sprinkle some salt and toss the vegetables once, while steaming. Cook pasta as per the instructions in the package. Drain it, reserving around 1/4 to 1/2 of the pasta cooked water. 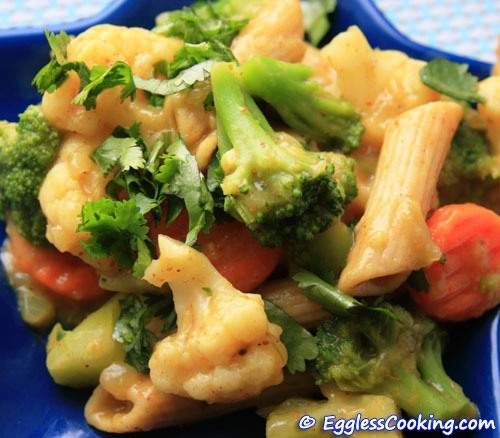 Combine together the steamed veggies, pasta and the curry sauce. Check for seasoning and sprinkle cilantro. Use sauce recipe but do rotini pasta, cooked chicken, sundried tomato slices and small diced fresh asparagus (want it crunchy!). 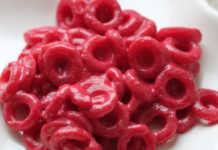 Mix all together and serve room temp or refrigerate first, your choice. Yes the combinations are limitless.